Sounds like this item and Sigil of Power are going to be a part of the legendary quest line. Unless they would use legendary pieces to upgrade the gear, which I really doubt. 10 of these are required for The Strength of One's Foes together with 10x Sigil of Power. It's the legendary quest line from Wrathion, the last black dragon. I acquired one of these after defeating Garalon in the Heart Of Fear raid while doing the raid finder Difficulty. But not from defeating any of the previous fights before him. Possible that it has a chance or guaranteed chance to drop from final bosses in the raid finder? Edit: Did raid finder again this week and seemed to get one off all the bosses I killed but it seemed the entire raid wasn't getting them as well. 10 of these sigils along with 10 of the Sigils of Power will be required for The Strength of One's Foes, the legendary quest line that every class can start as soon as they ding 90. Sigils of Power are dropped by raid bosses in Mogu'shan Vaults and Terrace of Endless Spring, and are lootable with one for each person in the raid currently on the quest. LFR, Normal and heroic modes all have a chance to give you a Sigil, however it works differently for each. Sigils of Wisdom are dropped by other raid bosses in Heart of Fear and Terrace of Endless Spring. The way the sigils work as drops is different in LFR and in Normal / Heroic modes. In LFR it works much like it does with normal gear, where everyone has a (small) chance to have one put directly into your bags, and it works on an individual basis. However, in normal raiding circumstances, it will appear as a item drop off of a boss, and everyone on the quest will be able to loot one for themselves. The quest along with a quest to reach Honored with The Black Prince (aka Wrathion, the last black dragon) are given by Wrathion in The Tavern in the Mists; these two quests together comprise the start of the legendary quest line. Are you sure everybody in raid(even LFR) gets a sigil? Seen them drop in normal, but did a LFR last night and did not see anybody get them. I assume it follow same loot rule, need to be illegible to receive loot to get a sigil. By now, we got four Sigils of Power but no Sigil of Wisdom. So I think that these items seem to be unavailable in Mogu'shan Vault... you will get Sigils of Wisdom only in Heart of Fear and Terrace of Endless Spring. Did not get any in LFR, hence why i was confused. Maybe there is a bug or maybe i don't know. Speculating that these drop from bosses in the second half of Mogu'Shan Vaults. In LFR this is called the Vault of Mysteries. Since Wrathion is particular in being anti Mogu, it wouldn't make sense for them to drop in Heart of Fear or Terrace of the Endless Spring. 10th of October 2012: LFR will begin 1 week after the normal mode version of Mogu'shan Vaults is unlocked. It will start with the two queues of Mogu'shan Vaults. You must finish the Guardians of Mogu-shan before advancing to Vault of Mysteries. 17th October 2012: Second half of Mogu'shan Vaults will unlock. 31st October 2012: Four weeks later the second raid will unlock in the LFR queue, 1 week after the normal version of the Heart of Fear is released. This will provide LFR users with access to the first of two queues within Heart of Fear, that being: The Dread Approach. 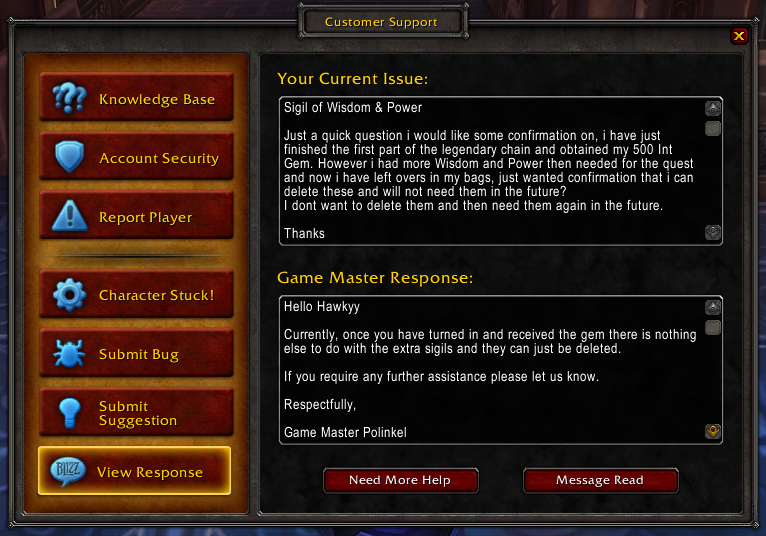 This means Sigil of Wisdom is not available for LFR users yet and wont be till Oct31st. can you only get chance to drop off of lfr boss the first time u kill that boss every week or is it possible to farm these by doing lfr multiple times? Is it possible to loot sigils even after u completed the bosses for the first time in the weekly reset in lfr? These will only drop on LFR difficulty the first time you complete it each week. Therefore, it is NOT possible to re-queue for LFR to attempt to get more sigils. I can confirm that the Sigil of Wisdom does drop from Heart of Fear on Raid finder difficulty off ALL 6 bosses. DO NOTE that it is a small chance of getting one randomly after a kill as with all loot in the new raid finder loot system and it will not replace and epic item, that meaning you can acquire both a Sigil of Wisdom and a piece of loot off the same boss. Those also drop from LFR Terrace of Endless Spring. Had 10 of Sigil of Power and 14 of Sigil of Wisdom. Completed the quest. Now 4 of Sigil of Wisdom left in my bags. What to do with them? Is it safe to destroy them, or they will have some use later? Just to be sure, when you did the LFR bosses and are not able to loot them anymore, can you still get sigils? I've been doing the damn LFR for 4 weeks now and not a single 1 of those has dropped. Has anyone got the same problem or am I extremely unlucky? Seems to have a much lower drop chance than Sigil of Power. I currently have just over 30 Sigil of Power and only 6 Sigil of Wisdom, indicating the drop rate of Wisdom might be as little as one third of that of Power. The drop rate on these in LFR is pathetic. I've run all 5 instances of LFR going on my fourth week now and I only have 2 sigils of wisdom and 4 sigils of power to show for it. Can we get a higher drop rate please Blizzard? Yesterday on 01/17/13, I ran the last half of ]Mogu'shan Vaults on LFR and on the last boss I received a Sigil of Wisdom. So I can confirm they will drop in LFR Mogu'shan Vaults. Now I have had 10 Sigils of Power for a while now and I am just going for Wisdom. It may be once you get 10 power now you only get Wisdom I have no idea. But I can confirm that Sigils of Wisdom will drop in LFR Mogu'shan Vaults also. I can confirm that you get Sigil of Wisdom in Mogu'shan Vaults in 5.1. Just did it on LFR, and I got a Sigil of Wisdom on the 3rd boss in 1st part of MSV. These are now dropping from Mogu'shan Vaults as well. I ran both LFRs hoping for my last two Power and got two of these instead, which makes me mad. From what I understood, these were supposed to become a rare drop from MSV to help those folks who were having bad luck and to compensate for the longer availability of Sigils of Power over Wisdom. I have the bad luck of having a load of these and not the Power, and it seems it's going to continue that way. i cant get the Sigil of Wisdom i have been standing at 5 if them and have 30 Sigil of Power. i think its just random but thanks for the tip that they drop in MSV i am really tired of running HOF. Is there some excellent why-didn't-I-think-of-that reason these are simply marked "Binds when picked up", and "Soulbound" after you've done so, instead of the more appropriate "Quest Item"? All the comments seem to confirm they are useful for nothing but this one quest. if you are already locked in LFR they wont drop again. so dont waste your time trying them if you are already locked. Ghostcrawler: We are going to make Power and Wisdom easier to acquire in 5.3. Well yaaay, today I found that these can still drop from MSV (LFR at least) despite what this site says. I need 1 more Power and after 4 bosses with no drop, I see a Sigil drop and it's Wisdom from Elegon. My luck fellas, it's just amazing. You have separate chances for sigils from the same boss in LFR and normal(/heroic?). So if you have killed a boss in LFR (doesn't matter if you got a sigil or not) you have another chance for a sigil on normal (and the other way round). Do a bit of homework people. My God.. don't come here whining because you have 30 sigil of power and 3 sigil of wisdom if you are either to lazy or to stupid to read. Each sigil has a proportionately higher chance to drop in one raid, than another. If you queue only for the raids that the sigil of power drops in, you MIGHT have an off chance of getting one of these. I think.. 20% vs 3% just from my bad memory. I needed both, so I did power first. Got 4 which puts me at 11. Now I needed 3 sigil of wisdom, queued for those raids, got 1 to put me at 8 wisdom and 11 power. NOTICE... I did not get any sigil of power from the raid I did for the sigil of wisdom? I COULD list the sigil / raid you need to do for each here, but I am not going to. If you can't read what is on the "Dropped by" tab (ON THIS POST EVEN! ), my posting it again here probably wont help much. Just dropped from feng... in MGV lfr. From my own experience it seems like for LFR the Sigil of Wisdom mainly drops from bosses in Mogu'shan Vaults, while Sigil of Power mainly drops from bosses in Heart of Fear. I'm confused. Do the raids reset weekly, so that once I go through a raid and loot bosses, I have to wait a week for them to "reset" so I can loot them again? I've already run/looted all the raids that are unlocked for me and eligible for Sigil of Wisdom/Power drops, but I only have a couple of each. So next week will the raids be reset for me to loot again and (hopefully) collect more Sigils? Surely they are still available on future weekly runs the first time each week, since the raids bosses are the only source of the Sigils? According to Wowhead, it seems that both sigils drop from ALL MoP raids (all raids but the last two wings in Siege of Orgrimar: The Underhold, and Downfall) as of 5.4. "All bosses in Throne of Thunder now have a chance to drop Sigil of Power or Sigil of Wisdom in addition to their normal loot for players on the appropriate step in the legendary questline. Players should also no longer be receiving excess Sigils of Power or Sigils of Wisdom. The first eight bosses in Siege of Orgrimmar have a chance to drop a Sigil of Power, Sigil of Wisdom, Secrets of the Empire, or Titan Runestone in addition to their normal loot for players on the appropriate step in the legendary questline." In other words, sigils will NOT drop from Siege of Orgrimmar wing 3 (The Underhold) and wing 4 (Downfall). Every other raid instance in Pandaria will have a chance to drop the sigils, with the only exception being SoO wings 3 and 4. About the difficulty to get the type of sigil that we miss...maybe keeping them in your bags and not dropping them in the bank could help. I explain what happenned to me : several months ago I did some raids and got 5 sigils of Power, 9 sigils of Wisdom (I would drop them in the bank after each raid to save on bag space). Then as my guildmates stopped playing, I stopped doing raids and stuck to levelling alts. Recently I decided to get the missing sigils in order to progress with the legendary quest on my main. First raid (remember all my sigils were still in the bank) I got 3 sigils of Wisdom...with those in the bank I was at 5 sigils of Power, 12 sigils of Wisdom. I came to Wowhead to look if exchange was possible, and got those posts about an unbalance in receiving sigils of Power. So on a hunch, I collected from the bank all my sigils into my bags, and carried on with raids. On 5 different raids, I got 4 times 1 Sigil of Power, never looted Sigil of Wisdom. Could be pure chance of course. One more to go, I will post to confirm or infirm if it worked. Two days later, joined a raid on the last boss, looted a Sigil of Power...so, maybe it is just luck, maybe it helps to keep all your Sigils in your bags. Anyway, I'm on my way to see Wrathion ! Ok... so I believe OAK... sorry guys... Lastnight 1/2/14 I was queued for MV to get sigils. A DPS must have left and I joined right at the last boss. I stayed and killed this boss. Never got a sigil. Now tonight... 1/3/14 I queued for MV again but started at the beginning. The last boss I didn't get a sigil off of 1/2/14 dropped one tonight 1/3/14, so I am really not sure... has anyone else joined a raid halfway and a boss they didn't get loot on dropped a sigil the next time (all LFR only)? These are annoying to collect. 19 Sigils of Power yet 9 Sigils of Wisdom. I throw a mini hissy fit in my chair if I get another Power. Post from Rygarius on the wow forums 10/24/2013 reposting here because the information is still relevant.
" Rewriting this to make it clearer with how drops for Wrathion's Legendary drops work in Patch 5.4. The Wrathion questline to get Pandaria's legendary cloak was removed in Warlords of Draenor, so if you still have some Sigil of Power and Sigil of Wisdom in your bag or bank, you might as well delete them now, I think. "An ancient symbol of knowledge from Pandaria's history."